The road winds down a long hill. As it turns it passes a couple of houses, a spring spilling out of the hillside, and what looks like an overgrown R.V. park. A blinking light is a stop sign to either stop or go for cars on either side of a one lane bridge. Only one car from either direction can cross the bridge at a time. The Green River Gorge Road (or Lawson Road as it is known in Black Diamond) crosses over one of the most beautiful sections of the Green River Gorge…and one of the more accessible areas outside of Washington State Parks. The Green River Gorge Resort has gone through many incarnations. In the 1920s it was privately owned resort with a hotel, cabins, and a service station. In the wild 70s and 80s it had a reputation as a party spot that drew locals and others who would come to jump off the cliffs and swim in the late summer. I remember going with a friend in the 1980s to go swim. At that time the old resort had an $2 entry fee, a snack bar, and a closed private campground. Today the old dilapidated green building houses a manufacturing facility for underwater salvage equipment and still has the private campground but the area is much quieter. In front it isn’t uncommon to see the local residents sitting outside on the old weather worn deck. You might even see a peacock on the roof or strolling across the roadway as you pass by. A few years ago the owners, of resort and surrounding area on both sides of the river, reopened access to the Gorge. For $5 that you place in a box on either side of the river you can park and access this incredible oasis. From the resort side of the river you park in a lot across the street from the resort building near a small pond. Then you enter through a chain link gate on the left side of the green resort building and step into another world. A wooden staircase leads under the one lane bridge towering above. It bends a way down to the river and passes by a spring that forms the waterfall further down. 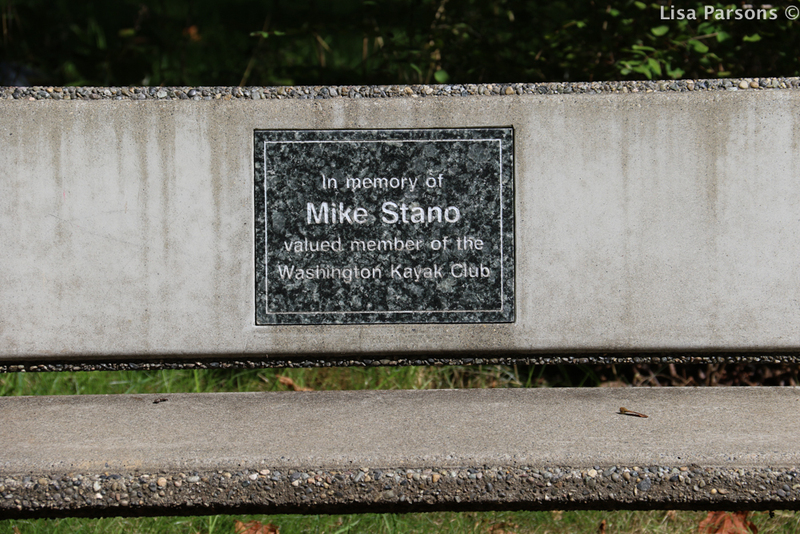 A platform has a bench beside the spring and overlooks the river below. The end of the wooden staircases transitions to worn sandstone steps and pathways. One trail leads to a cave behind the iconic waterfall that you can see from the bridge overlook above. Behind the waterfall is the cave with a pool carved out of the sandstone. A steel lined fence runs along the permitter of the cave to keep anyone from falling. 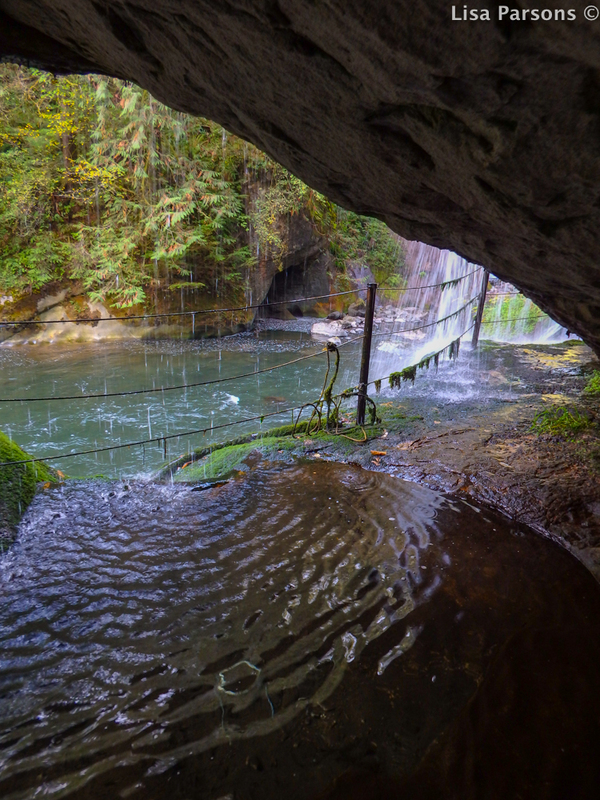 Water droplets form rain beneath the eve of the cave as the waterfall cascade past the opening, streaming down the sandstone face beyond the lip of the cave. I’ve often wondered if the water in the carved stone pool was heated at one time because to sit in that cold water in the shade of the overhang would be quite frigid. 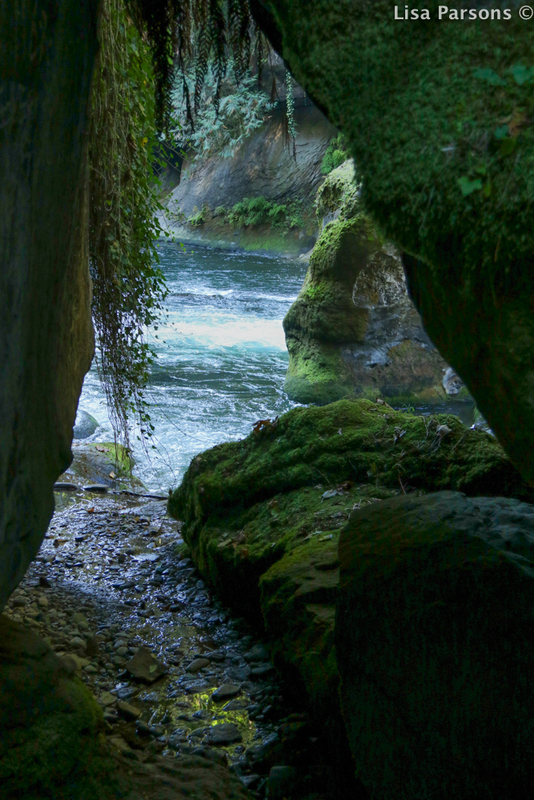 Below the falls, when the river is low, you can walk between two large overhanging stones to reach the waterfall. Draped on the sides of the stones are maidenhair ferns. On the other side of the stones in the other direction is a small rocky beach and another bath carved out of the sandstone. From here you can enjoy a swim to the water fall or a float down the green alley to another beach farther down. This area is only safe to swim at very low water levels that can be found only at the end of July and August. Beyond the stairs the trail continues further along a worn sandstone foot path between beds of bright green moss. It turns beneath a stone archway made by two leaning sandstone rocks. Ivy hangs at the side of the doorway leading to the river beyond. Walking through it feels like your entering a lost world of wilderness. There the trail continues across the sandstone and into a forest growing on the stones. The footpaths are slippery. Above the pathway is another smaller but taller waterfall cascadeing 100 feet above the river. The trail reaches a sandstone overlook and then a sharp path leads down to a small moon shaped rocky beach right at a surf wave called Paradise Ledge. 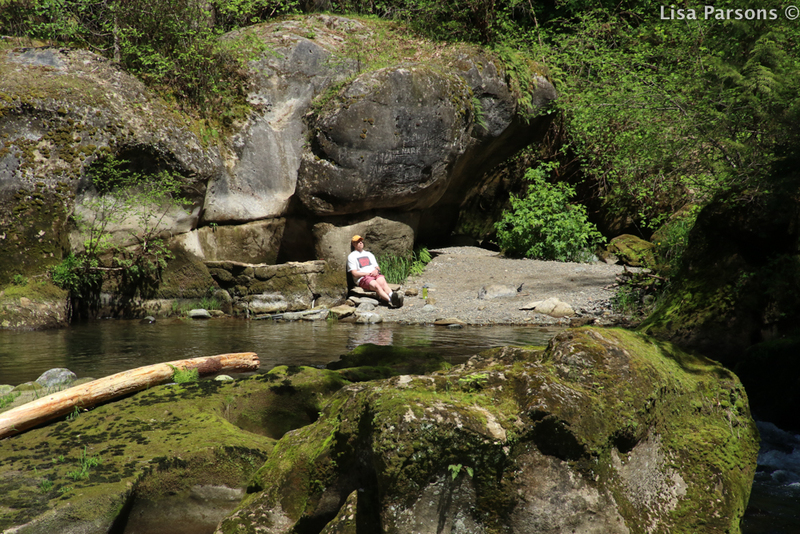 A small pool behind the rocky outcrop next to the ledge is a great place to wade in on a hot summer day. In the early part of the year you might catch a show of white water kayakers surfing the play wave. In the fall you can glimpse a salmon leaping up the narrow ledge of water or resting in a small sandstone pool at the swift waters edge. On the other side of the river you can access the Gorge by turning west into a grassy parking area through an open gate. Just beyond the gate is a cement and steel box for your $5 entry fee. Park and follow the trail past the sign says “River Access” that is posted on a tree. From there a steep trail leads down to where the kayakers put in. From the kayaker’s trail you can find perches that overlook the falls and the green alley. A sloping sandstone beach marks the entry and exit for kayakers and is a sunny spot at mid day along the river corridor. From the parking area you can continue straight through another gate and explore the Old Town of Franklin and river access previously posted on my blog. Being able to access this part of the river is a treat. For years it was closed and although I was given permission to explore the area for my conservation work it feels less like trespassing now that it is open to the public and can be enjoyed by all. However, as with any privilege, all it will take is a few yahoos jumping off the cliffs, leaving their trash, or just being jerks for this area to be closed again. So bring your curiosity, a good pair of skid proof shoes, and enjoy the area. Please take your garbage with you and use common sense when accessing the water for swimming or floating. Please do your part to keep this place open to the public! My next blog post will be about the river downstream of the Gorge. A secret swimming spot, a coal car, and a mushroom rock. For more info on visiting the Green River Gorge Resort area visit the Outdoor Project: Green River Gorge Bridge Overlook.